Proud members of the Class of 2017! I am writing these notes on Commencement weekend when we have just sent the final graduates of Augsburg College into the world, full of promise and aspiration – as has been the case for almost 150 years. As you will read in this issue of Augsburg Now, the change of our name to Augsburg University will become official in September and we will welcome the first class on Labor Day weekend. We are busy preparing for this exciting new era for Augsburg! For some, the name change may reflect a break with Augsburg’s past. For others, perhaps this is a welcome acceptance of the need to embrace the future. For the Augsburg community, however, the change is a remarkable opportunity to re-present Augsburg to the world – to tell a story that is about an abiding mission and identity shaped by faith, academic and civic values, and at the same time to point to innovative and urgently needed responses to our dynamic environment. In other words, this change is about the pivot from “either/or” to “both/and.” This is about embracing the best of past, present and future. This is about Augsburg University. The almost 1000 new Auggies who commenced into the world this spring reflect in their achievements and aspirations the foundation for embracing this change. Across both undergraduate and graduate programs, the class of 2017 achieved academic excellence of the highest order, excellence that defines a university. 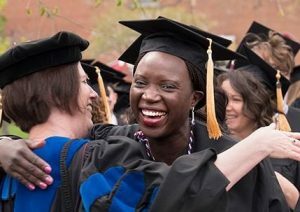 National and international honors for scholarship and service; exemplary undergraduate research that equips students for graduate work and professional opportunities; innovative community-building that strengthens democratic engagement; and a commitment to equity in education that promises to change the world. At the same time, our newest graduates reflect the diversity that we expect in a university – diversity of ethnicity, thinking, life experience, identity and ability – diversity not for its own sake but for the promise of a more robust, healthy and just world. As I watched our diverse graduates cross the stage, I could not help but be filled with hope in our future leaders who already have learned to navigate difference in ways that unite rather than divide.